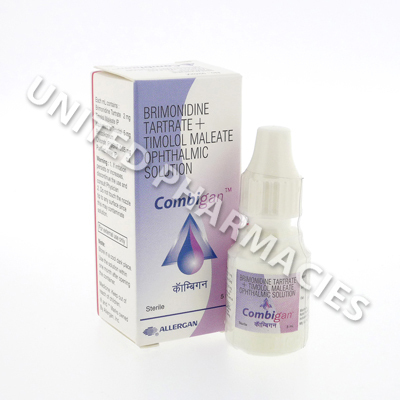 Combigan (Bimonidine Tartrate/Timolol) eye drops are used to treat glaucoma, ocular hypertension and other related eye conditions. Manufacturer : Piramal Healthcare Ltd.
Combigan (Bimonidine Tartrate/Timolol) eye drops are used to treat glaucoma, ocular hypertension and other related eye conditions. These drops combine 2 active ingredients. Brimonidine tartrate belongs to a class of medicines called alpha agonists. It works by increasing the amount of fluid drained from the eye. The other ingredient, timolol, is a type of beta blocker that helps to reduce the formation of fluid in the eye. Together, the 2 ingredients help to reduce high pressure in the eye, thereby preventing serious damage to the eyes. Combigan (Bimonidine Tartrate/Timolol) eye drops are applied directly to the affected eye or eyes in accordance with the instructions provided by your doctor. You may be told by your doctor to apply the eye drops twice per day, at 12 hour intervals. If you are not sure of how to properly administer these eye drops, you can ask your doctor. Never apply more than the amount prescribed by your doctor. Tell your doctor about all side effects that you notice. There is also a slight risk of more serious side effects occurring as a result of taking this medication. Consult your doctor straight away if you notice muscle weakness, hallucinations, wheezing or any other side effects. If you suffer from lung disease, heartbeat problems or heart disease, this medication may not be suitable for you. Patients who suffer from diabetes may be at increased risk of hypoglycaemia (low blood sugar levels). Ask your doctor if you are concerned about this. Always use Combigan (Bimonidine Tartrate/Timolol) as you have been prescribed by your doctor. Never self-medicate or change your dosage without first consulting your doctor. The correct dosage can vary depending on your health, medical history, and the severity of the condition being treated.